Laser engraved bricks have the power to commemorate an individual or event like no other. 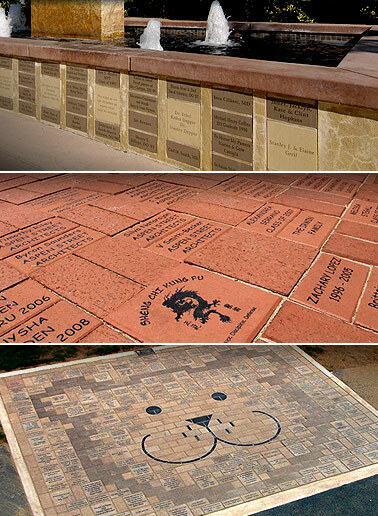 Personalized bricks, tiles, and pavers have been used by schools, churches and cities in donor recognition programs. These fundraising bricks, or “donor bricks / memorial bricks”, help raise millions of dollars for school fundraisers, university alumni bricks, veterans engraved brick memorials, hospital memorial brick gardens, religious and church bricks fundraisers, civic groups, library laser marked brick and laser marked bookspine fundraisers, athletics program donor bricks and stadium fundraisers. Laser engraved bricks, engraved pavers, company logo bricks, personalized bricks and tiles highlight donors and add beauty and personality to new and refurbished buildings and landscapes. If you need a laser engraved sample to help move your fundraising project along, contact info@laserimpressions.com or call 1-800-344-LASER(5273). Visit our sister site at www.engravedbricks.com for a complete portfolio of brick-engraving solutions from Laser Impressions.